The solar eclipse this past week (May 20-21, 2012) over southeastern Asia, the northern Pacific Ocean and western North America was an annular type eclipse. This means that the new Moon was too far away from the Earth to block out the solar disk completely. Instead, for those viewers directly in the path of annularity, a bright ring of light surrounded the shadowed Moon. For viewers outside this narrow path, the Sun was partially eclipsed – only a portion of the solar disk was obscured by the Moon. For this particular eclipse, the Moon was about as far away from the Earth as it gets. The result was a ring of brilliant light about as big as has ever been observed. The next solar eclipse will occur on November 12, 2012 and will be observable only over northern Australia and the southern Pacific Ocean. The photo above (left) features a partially eclipsed Sun just before sunset taken near Chandler, Arizona, several hundred miles from the path of annularity. The sky was reddened by smoke from wild fires. 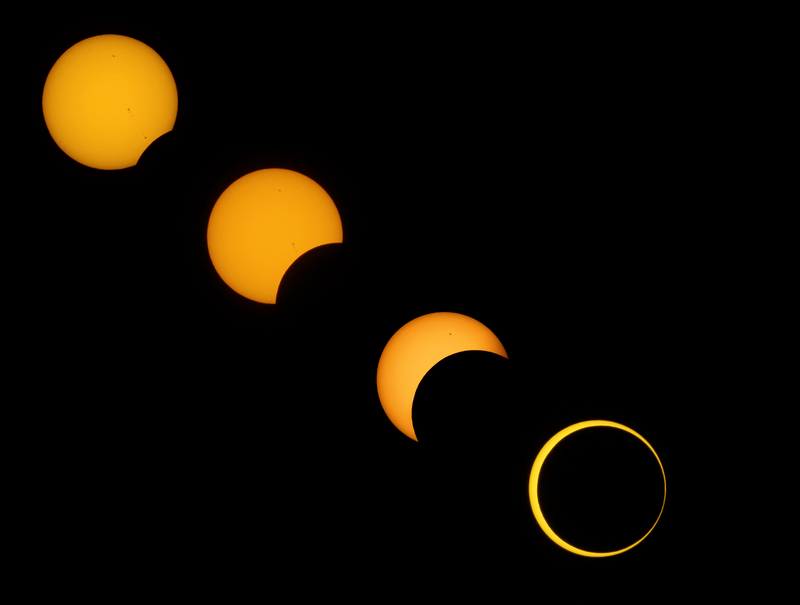 The photo at the top right shows a sequence of the annular eclipse as viewed near Red Bluff, California. Note the sunspots disappearing behind the Moon. The photo to the right shows the safest way to watch an eclipse – using a pinhole approach. In this case the shadow of a tree on the neighbor's house acted like thousands of pinhole cameras, capturing the partial solar eclipse (in Grand Junction, Colorado) many times over. Photo details of annular eclipse: Canon PowerShot SX40 HS camera and a homemade solar filter that used Baader solar film; handheld (no tripod). Photo details of partial eclipse: Photo taken on May 20, 2012 at 7:16 pm (local time) with a Canon 40D and Canon EF 70-200mm f/2.8L USM IS lens at 200mm. Due to the large difference in the brightness of the Sun and the foreground, two exposures were combined. The exposure for the Sun was 1/1000 second at f/8 with an ND1.8 (6X) neutral density filter. The exposure for the foreground was 1/6 second at f/8 with an ND1.8 (6X) neutral density filter. Photo details of pinhole eclipse: Taken with a Sony Cybershot-DSC-S730 camera.